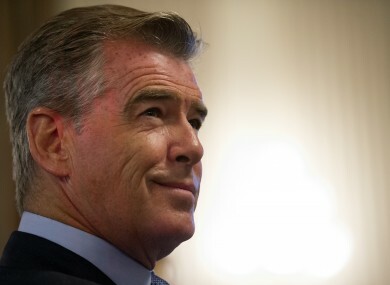 THE NEXT JAMES Bond could be black or gay, argues 007 veteran Pierce Brosnan. “Sure. Why not?” the Irish star was quoted as telling men’s magazine Details when asked if he could picture a gay Bond. Brosnan said he doubted Bond producer Barbara Broccoli would allow a gay Bond to happen in her lifetime. “But it would certainly make for interesting viewing,” he added. Elba, 42, is seen as a frontrunner to succeed Daniel Craig, who has played the suave British agent for the last 10 years. Brosnan played Bond in movies Goldeneye, Tomorrow Never Dies, The World is Not Enough and Die Another Day in the 1990s. His remarks were published five months after another previous 007 actor, Roger Moore, was blasted on social media for suggesting race should be a factor when casting the next Bond. The 87-year-old star, who played 007 in seven films from 1973 to 1985, said his remarks were lost in translation. “An interview I gave to Paris Match implies I said something racist about Idris Elba. That is simply untrue,” Moore wrote on Twitter. “When a journalist asks if ‘Bond should be English’ and you agree, then quotes you saying it about Idris Elba, it’s out of context,” he added. London-born Elba is the son of a Sierra Leonean father and a Ghanaian mother. His most famous role to date is playing former South African president Nelson Mandela in “Mandela: Long Walk to Freedom”. Ian Fleming’s original Bond novels say the secret agent was the son of a Scottish father and a Swiss mother and spent much of his early life outside Britain. Orphaned at 11, the fictional hero then lives with an aunt in southeast England and is educated in Edinburgh. Email “Time for black or gay 007, says Brosnan”. Feedback on “Time for black or gay 007, says Brosnan”.